Now you can be an insider in Vietnam learning about its art and textiles! This tour has been carefully designed to offer you Vietnam’s must see places as well as activities which immerse you into the arts through meeting locals with options for hands on workshops. Begin your travel in Ngoc Thuy by staying in a homestay at a local artisan’s house. Learn about its traditional art of embroidery. Visit bustling markets and meet hill tribes. Try painting on silk. Meet fashion designer, Ava, at her studio. 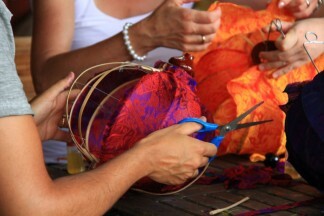 For those of you who have that creative eye, Vietnam Art & Textiles Adventure is the tour for you! You will be met upon arrival in Hanoi by our representative who will be holding a sign with your name on it and be driven to Ngoc Thuy village. Your accommodation is a special stay at an artist’s home. 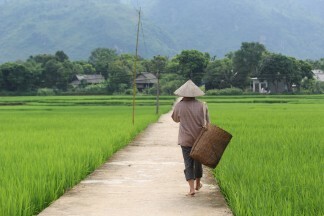 Ngoc Thuy, a rare quiet village by the Red River, is just a short distance outside of Hanoi. It has become a chosen land for artists to create their own haven. Artists open their homes to you in a true hospitable and artistic way. Ancient wooden house and ethnic stilt houses with a brick wall leading to a tree top room give you a glimpse into Vietnam’s artisit culture. Staying in Ngoc Thuy and speaking with artists is an extrardinary experience. After your tour briefing, you can take a leisurely cycle ride (15-20km) around Bac Bien village, lying on the left bank of the Red river. This begins your exploration of the local village life. Pedal through small alleys of Bac Bien village to the Duong river’s bank. Then take a local boat ferry to cross the river to its left bank. Ride along the dike, from village to village, to see many traditional typical houses; pagodas, temples, the local market and emerald rice paddy fields. Get to know the villagers and learn about their daily lives. Stop at a local restaurant for a bowl of noodle soup. Dinner and overnight at artist’s home. After breakfast, drive to Hanoi. Visit the One-Pillar Pagoda and the informative Ethnography museum. After lunch, continue to the Temple of Literature, and the nearby Craftlink boutique, a Vietnamese not – for – profit Fair Trade organization which helps traditional craft producers to revive their culture and improve their livelihoods through handicraft production and marketing. 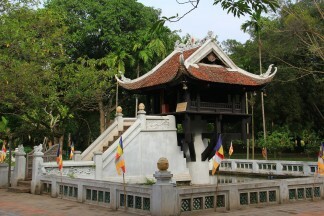 Visit Ngoc Son Temple and Hoan Kiem Lake. 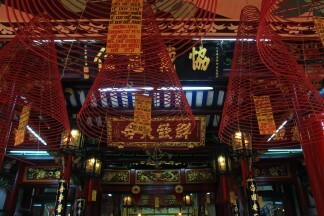 Stroll along Silk Street located in the heart of the old quarter; enjoy the shops selling silk products. Attend the Thang Long theatre to enjoy the famous Water Puppet Show, a unique Vietnamese traditional art form that takes its origins from rural festivals in Vietnam. Artists, both men and women, stand waist-deep in the water to manipulate puppets, making them move about, talk, laugh and even dance on the water surface. The puppet artist was born in a family with the tradition of making and performing art of water puppetry. He has studied and experimented “one-artist performance” for many years, introduced innovative stories in the show and now takes pride to open his house to interested travelers to share his passion. His residence is also home to a small water puppet “theater” and can host up to 15 audiences. A show lasts for about 30 minutes and is preceded by an intro-talk about Vietnamese art of water puppetry by the artist over a welcome tea. After the show, audiences can play with the puppets and get to understand how they work under the water as well as learn to make one. Today we drive to Quat Dong village, 30km south of Hanoi. Quat Dong is considered to be historical home of embroi¬dery in Vietnam. A local resident, Le Cong Hanh (1606-1661) was a member of King Le’s envoy to China where he learned the craft of embroidery. After returning to his homeland, he taught this craft to the villagers of Quat Dong. 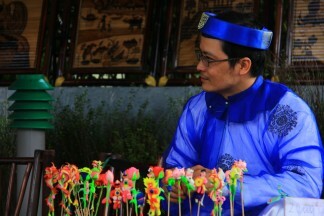 Ever since then, he has been regarded as the master and patriarch of Vietnamese embroidery. For many Quat Dong villagers, embroidery is considered a long-standing tradition. Now Quat Dong’s products such as table-cloths, bedspreads, sheets and pillowcases are exported to many countries including Japan, EU countries and the USA. Continue South-West to Mai Chau Valley (approx. 3.5hours), inhabited by Thai and Muong descent. Walk or cycle around peaceful hill tribe villages. You will have a chance to learn about Thai’s techniques of weaving as well as their decorative pattern. Dinner and accommodation at a Mai Chau Ecolodge. After breakfast, drive to Xa Linh village (approx 30km), inhabited by the H’Mong hill tribe. It is known for the very bustling Paco Sunday Market, when the H’Mong gather in their beautiful costume to do their trading of goods. Learn about their lifestyle and traditional weaving. Proceed to the Hanoi Airport. Lunch is en route. Take an evening flight to Da Nang. Transfer to your hotel in Hoi An. Dinner and accommodation at hotel in Hoi An. Embark on a walking tour of Hoi An. Discover the historic town which used to be a prosperous seaport city during the 16th to 18th centuries. Visit Hoi An’s colorful local market, Tan Ky old house, Fukien Assembly Hall, and the 400-year-old Japanese covered bridge. You can also see local residents raising silkworms for Hoi An’s textile industry. In the afternoon, take a hands-on silk painting class. After a detailed explanation of the history of silk painting, the different techniques and the possibilities of painting on silk, you begin your own project: a pillow, scarf, skirt, top, babydoll dress with patterns that are given to you to choose from. Take home a small item (complimentary). Inclusion: Hands-on silk painting class for 3 hours, 1 gift included. Meet professional fashion designer, Ava, at her studio in Hoi An, and enjoy an in-depth introduction into fashion, design and special weaving techniques by Cotu ethnic. Timing: ½ day or full day if includes a workshop at her design studio. Rest of the day at leisure. Overnight in Hoi An. Today, you can relax or choose an activityfrom various options before boarding your flight to Saigon. Pick up at your hotel and head to the meeting point, Hai Scout Café. Enjoy a welcome drink. Visit Hoi An’s market, and experience the amazing sights, sounds and aromas of this busy place. Iinteract with the local sellers and purchase some of the ingredients to be used in the cooking lesson later. Board the boat for a leisure cruise (25 minutes) along the Hoi An River to the Red Bridge Cooking School. This is also a good chance to see some of the local life. Upon arrival, discover the cooking school’s herb and vegetable garden, before learning about some of Hoi An’s and Vietnam’s well-known dishes. The cooking lesson last about 2 hours – each dish is firstly demonstrated by the Red Bridge chef’s, before you prepare the same dish yourself. Included in the class is a brief introduction to Vietnamese food carving (plate decoration). After the lesson, sit down and enjoy what you have cooked. My Son, UNESCO heritage, is the religious capital of the former Champa Kingdom. A classic half day tour includes a guided walk around the temple, a traditional Champa folk music performance and round trip transfer from Hoi An (1hour/way). This enriching excursion is unique. It is complemented with little delights on the way. It takes you off the road more travelled into the local life. Stop by a lively morning “temple-market” to soak up village atmosphere and try hands making some handicrafts (rice cake, weaving). After visiting the sanctuary, enjoy My Son’s specialties in the nearby village. Spend relaxing time, sharing stories with your host or photograph the lotus pond, lake before heading back to Hoi An. You are met at your hotel and driven to airport for flight to Saigon. Dinner and accommodation at hotel in Saigon. In the morning, take an immersive tour “Saigon Streets Secrets”, guiding you to some interesting corners to absorb the metropolitan blended local lifestyle, influenced by oriental traditions and occidental vibes. Walk leisurely through some thematic streets selling birds, bonsai, miniature landscapes, antiques and handicraft. Visit the traditional medicine museum and explore the art of healing. Browse special “markets” exposing decorative flowers to wartime objects, evoking strong scents of local life. During the interactive exploration, you will learn how important sacred objects and practices are used by the Vietnamese to get them through times, physically and spiritually. Lunch is an authentic home cooked meal. In the afternoon, walk through the colonial part of Saigon, photo stop at the Reunification Palace, Post Office and Notre Dame Cathedral area and the History museum. In the evening, explore Saigon nightlife on the back of Vespa (4 hours, from 6pm). Part night excursion, part street food adventure. First stop is to lively Café to “watch the world goes by” and enjoy cocktail and appetizer (inclusive) before adventuring into favorite local eating spot. Guests experience the nightlife of Saigon the way locals do, all from the back of a vintage Vespa scooter. The tour will start with a ride to part Chinatown and then heading to District 4 through busy streets and alleys to see the night life of locals and enjoy street seafood and cold drinks, places that foreigner won’t be found. Leaving district 4 to district 3 the tour passes through downtown district 1 to take in the sights on the way to Banh Xeo, a specialty of Saigon, and have southern food with the locals. Then the tour will continue to a hidden Vietnamese-style coffee shop to experience Vietnamese music (live) as a local. After this the tour will bring guest to a lively bar to enjoy the drinks with live music. Guests ride pillion behind our drivers. Inclusion: 4 hours, Expert guidance by art specialist, English speaking and subject to availability. Si Hoang can be named as the inventor of Ao Dai painting. Hard working, creativeness and inspiration has brought him success. He has turned his private peaceful and cultural space, Long Thuan Garden (40-min drive from city center), a complex of lake, rice field and garden, into the first private Ao Dai Museum of the traditional Vietnamese long gowns. Visit the Ao Dai museum and artist immense garden and explore the design, cutting, sewing, drawing and embroidering process of Haute Couture Ao Dai, which is skillfully and entirely handmade. Exclusive lunch with artist Si Hoang at Long Thuan Garden can be arranged on request and upon to his availability. 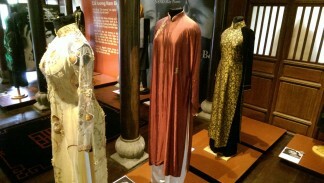 Possible to have a special Ao Dai tailor-made by Si Hoang’s artisan. For dinner on your last night, experience a Vietnamese evening. Includes a live Vietnamese cultural show at the iconic Saigon Opera House, with sophisticated lighting and mesmerizing live music played from 20 traditional Vietnamese instruments! Daily life work tools are personalized and highlighted in these productions, and are incorporated with some truly heart-stopping feats and wonderfully choreographed snapshots of rural and urban life. Seize the opportunity to sit back and be thoroughly captivated, letting an hour fly by unheeded as your senses are taken on a visual, aural and inspiring journey. The evening would not complete without passing on to table at a Vietnamese contemporary dining room. Typical Vietnamese dishes from Mother’s kitchen have been taken into next height with innovative fusion techniques and presentation. A feast of sights and tastes! You are met at your hotel and driven to the airport for your flight onward or homebound.